Alpharetta, GA: Dorothy Norwood affectionately known as the “World’s Greatest Storyteller” has, had an incredible journey that continues as she releases new music entitled, “Breathe on Me” featuring Bishop Rance Allen, Beverly Crawford, Bishop James H. Morton and Kareem Jackson. “Breathe on Me” is a song that touches the hearts of the listeners. We need a touch from the Lord and another Pentecost to shower the Holy Ghost power down on us. Acts 2:1 “And when the day of Pentecost was fully come, they were all with one accord in one place. And suddenly there came a sound from heaven as of a rushing mighty wind, and it filled all the house where they were sitting. And there appeared unto them cloven tongues like as of fire, and it sat upon each of them. And they were all filled with the Holy Ghost, and began to speak with other tongues, as the Spirit gave them utterance.” Breath on Me. “Weather the Storm” At first listening, you will quickly understand why Dorothy Norwood has been deemed by her peers the title of the “World’s Greatest Storyteller”. “Weather the Storm” is the story of hurricane Harvey’s Disaster that affected Houston, Texas, in 2017. Storms are not just weather related; there could be a storm when the sun is shining. A sickness, a loss of a loved one, financial difficulties, any personal struggles are storms; but you can “Weather the Storm”. On the heels of the success of her 52nd solo project “An Incredible Journey” which made its debut at number two on the Billboard Charts, for twelve consecutive weeks and landed her an article in Billboard Magazine, “Dorothy Norwood Tops Herself”. 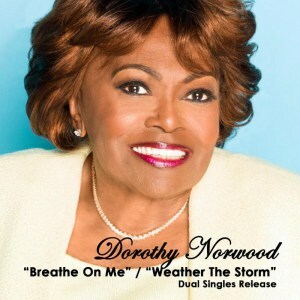 Produced by Dorothy Norwood and Cedric Thompson, on DNMG (Dorothy Norwood Music Group), critics are saying that Dorothy Norwood has done it again with another hit record; Recorded “LIVE” at Mt. Ennon Baptist Church in Clinton, MD, host Pastor, Rev. Delman Coates, P.H.D., Senior Pastor. The stage was set for an awesome move of God! Norwood is currently in the studio finishing up with post production on her 53rd solo album entitled, “The Journey Continues” that is soon to be released.